The history of the palace dates back to 1606 when King Christian IV had a summer residence built in Kongens Have, his new park. 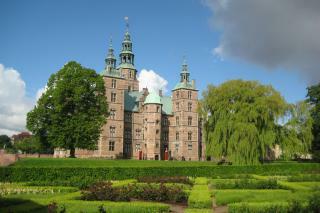 Today, Rosenborg Castle is a fine representative of the many buildings attributed to King Christian IV. The Palace was designed in the Dutch Renaissance style by architects such as Bertel Lange and Hans van Steenwinckel. It was in use as a residence until 1710, when it became the setting for the royal collections. Even as far back as in 1658, treasures from other palaces and castles had been transferred to Rosenborg Castle. King Christian V especially had moved the sceptre, sword of the realm and other regalia from Copenhagen Castle. Rosenborg Castle was opened to the public in 1838. Anne of Denmark was born in 1574 and was King Christian IV’s elder sister. The two siblings spent their early childhood together and were known to be close. They stayed in touch with each other even after her marriage in 1590 to King James VI of Scotland (later James I of England and Ireland). Brother and sister shared, among other things, a keen interest in music and architecture. Several famous architects and artists produced commissions for them both. Inigo Jones originally worked for Christian IV in Denmark and subsequently in England for Queen Anne where he created sets and stage design for royal feasts. Later, the artist undertook costly extensions to Somerset House, the Queen’s residence in London, and Queen Anne’s House in Greenwich, one of the most important buildings from this period. Jones appears to have played a role in uniting the two royal houses. He was a member of the English delegation that travelled to Denmark in 1604 to attend Prince Christian’s christening. King James was the child’s godfather and at the baptism, he presented Christian IV with the English Most Noble Order of the Garter, a powerful symbol of the close Anglo-Danish links forged by the royal marriage. The oldest of its kind in the world, the order may be admired in the Treasury at RosenborgCastle.